ChemMax 2 offers reliable quality, value, durability and the proven protection of Dow Saranex 23P barrier film. ChemMax 2 is the second level of barrier protection in the new ChemMax line of products from Lakeland Industries. 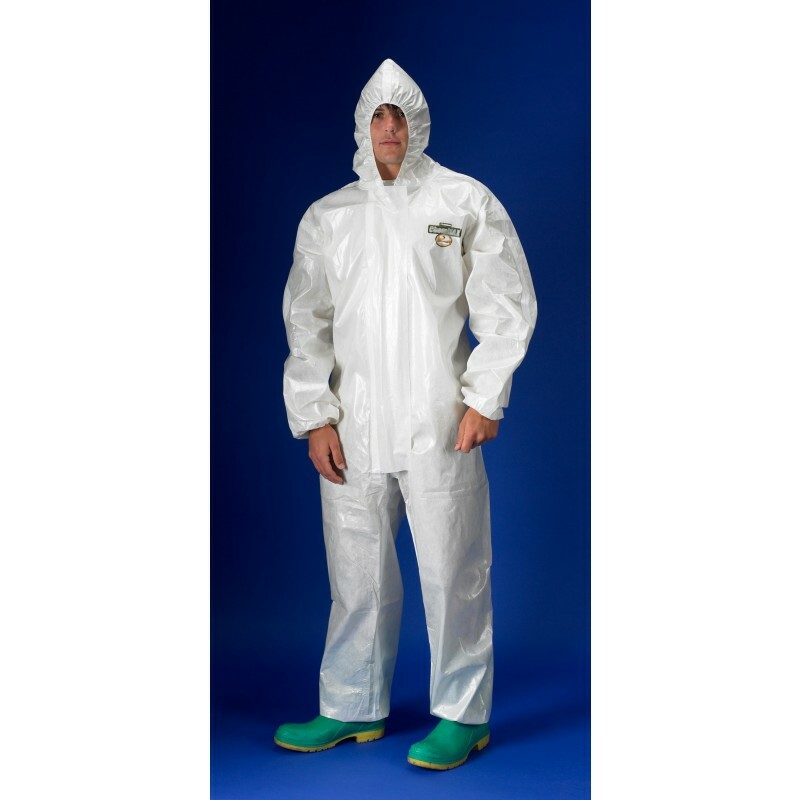 ChemMax 2 is a superior and economical chemical protective suit designed with Dow Saranex 23P film on two layers of a unique bi-component spun bound nonwoven substrate. 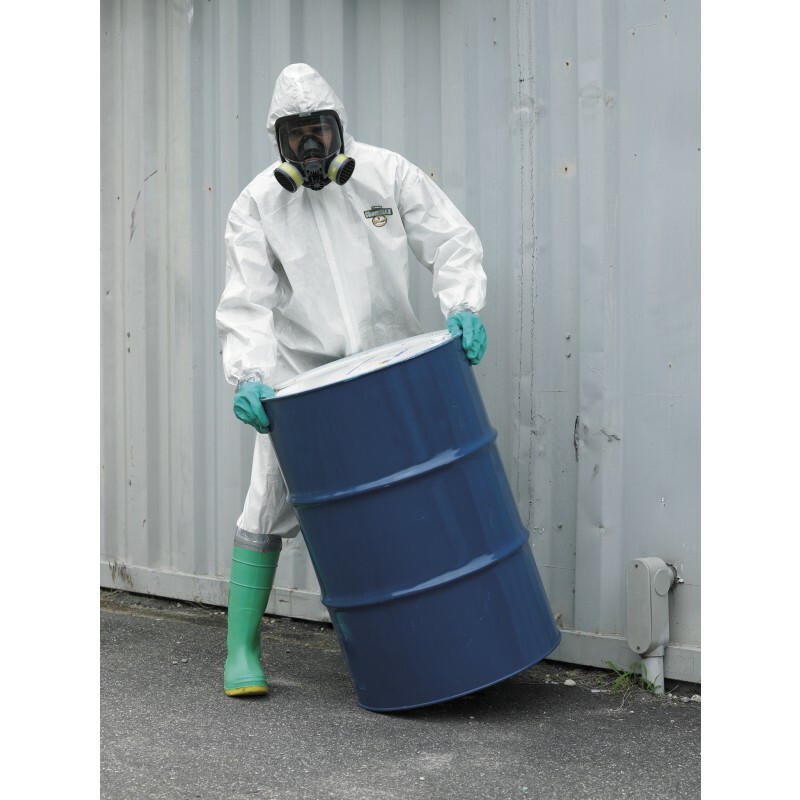 Its unparalleled strength and softness also provides protection for chemical mixing & handling, environmental clean up, hazardous materials remediation & response, pharmaceutical manufacturing, spray painting and general industry applications. ChemMax 2 is useful in protecting against hazardous chemicals and contaminants found in the work place. 1. ChemMax 2 is not flame resistant and should not be used around heat, flame sparks, or in potentially flammable or explosive environments. 2. Garments made of ChemMax 2 should have slip resistant or anti-slip materials on the outer surface of boots, shoe covers or other garment surfaces in conditions where slipping could occur. Note: Chemical Resistance Data is in accordance with ASTM F-739 test method. Testing is performed on fabric samples only, not finished garments. Sources for all test data are independent laboratory conditions and not actual use conditions. Serged Seam This is a simple stitched seam. It is economical, but is generally not used for chemical/splash/liquid type protection as the seams are not designed to resist liquids. It is designed for dry materials/dusts. Sewn and Bound Seam These seams are serged, and then an overlay is chain stitched through all the layers. This provides resistance to liquid invasion, and is appropriate for liquid threats. Heat Sealed Seam The seam is sewn and then sealed with a heat activated tape. This method provides liquid proof seams, and is used for environments where contact, not splash risk is present. i.e. you might immerse your foot or leg in the liquid by accident briefly. Heat Sealed Plus Seam – Same as the heat sealed seam, but it is also sealed on the inside of the suit as well providing extra protection. .